Top » Catalog » Modifications » Bolt-On Mods » NSPBET Bookmark Us! Remember those Sparkly Pop Bumper Enhancement Things that were reportedly devised by the famed pinball designer Dennis Nordman? What ever happened to them? Why are they becoming hard to find? 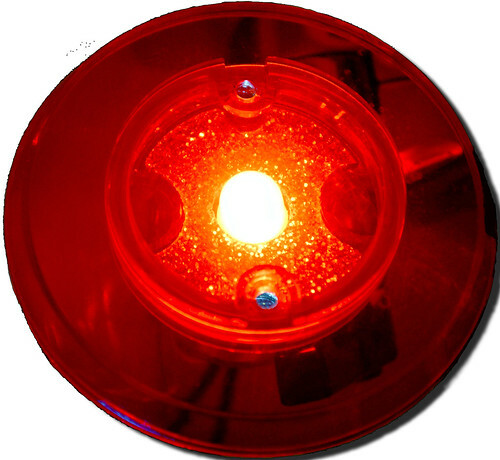 The story goes that Dennis came up with a simple "Thingy" which dropped into the body of a pop bumper body and helped hide the wires, screw heads, and would center the lamp in the center of the transparent Popcaps. This product is our implementation of Dennis' idea with the main change for the "thingy" to drop inside our translucent pop body bodies and are designed to specifically fit those bodies. They will probably work in other manufacturer's bodies; but have not tested them extensively. They can easily be shaved down (if necessary) to fit any body with a dremel, sandpaper, or sharp exacto knife. Gold Glitter New! Exclusive color. Other colors are possible; please contact us if you have a specific application/color in mind. 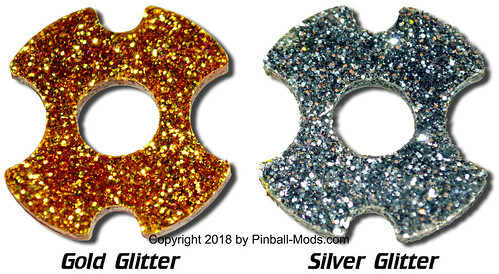 We would recommend using the Silver Glitter for any "cool" pop bumper cap like blue, green, purple, or teal and use the Gold Glitter for any "warm" pop cap such as red, yellow, or orange. For Clear popcaps; either color would work and would depend on the art of the game or the effect desired. To install: Simply unscrew the existing pop bumper cap; drop our Thing into the cavity of the base while centering the lamp to the inside hole; and screw the pop camp back in-place. Please note: We do not recommend using our Things with standard incandescent bulbs as it may cause the Thing to deform due to heat from the lamp. Instead we recommend using any of the new LED replacements available on the market. Notify me when "Pop Bumper Thing" is re-stocked.